Though it may not grab you straight away - with it's lack of photographs and traditional ingredients lists - this is a fantastic book, bursting with great recipes and inspiration. Slater at his best. 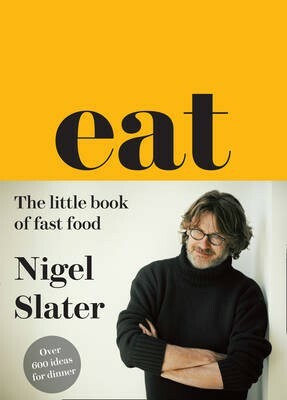 I have to admit, I wasn’t initially enamoured with this book, in fact the format in which the recipes are presented actually kind of ticked me off - why not make my life easier and list the ingredients Nigel? Over time though I come to love this little book. I don’t even notice the format. I now think of these recipes as little stories that invite the same creativity that led the author to choose this format in the first place. These burgers were great! Very juicy and flavorful. I subbed preground turkey for homemade ground chicken. The ground meat is mixed with lemon juice, garlic, s&p, panko and herbs. He suggests a "good handful" of tarragon, but since my plant is still tiny, I subbed a mix of dill and chives. I also made four patties instead of six. These were absolutely delicious. Like Westminstr, I used pre-ground turkey to simply things. I did whizz the other ingredients in the food processor to really get them blended before adding to the turkey. My tarragon plant is growing like crazy at the moment, so I used that herb and it was so tasty with the other flavors. I made this but with goose breast and an apricot rather than a plum. Served on a bun. Delicious! These were quick and easy to make. A fantastic weeknight meal. Next time I would serve these up in a burger bun, or soft tortilla with some sweet chili sauce. I didn't have enough raw king prawns so I topped it up to 250g by using a bag of frozen seafood mix in my freezer. It has pre-cooked mussels, shrimps and squid, all pre-cooked. I served this as part of a picnic and it's lovely. Tasty and great for those nights when you can't be bothered to cook but want to eat something delicious. Extremely simple dinner when you have some leftover chicken. Son loved it, he didn't even mind the coriander leaves. As much as I love mayonnaise and bacon, the amount of mayonnaise can be halved and the bacon isn't really necessary. Couldn't be any easier in terms of preparation. I used arugula instead of spinach because the arugula provided a very nice contrast to the richness of the sausage and mozzarella. Even my partner who isn't crazy about arugula thought it was a nice touch. It would have been a bit bland with just spinach. I think I'd make this again, if I needed to make a quick meal, or had rolls on hand. Feel free to play with sausage types. I like to add ginger and garlic to the chicken marinade, also garnish dish with plenty chopped basil mint and coriander. This is truly a gem of a dish! This was nice enough but you need to dice your root veggies really, really small. I went with 0.5 cm dice and this meant it took ages to cook through plus the swede - rutabaga - cooks slower than the other veggies and should most definitely have gone into the an before the rest. If your knife skills are better than mine and you don't use a large carrot or potato - or you have an enormous skillet - you might get the veggies cooked through in the times given, but I'm sceptical! Also (and I did think this before I started) it really isn't at all spicy ... I think I would add something else if there is a next time. My ratio of veggies to fish was way off so this wasn't a great success, but it was nicely warming and, done right, could be lovely. Salmon needs careful frying, the pieces I used were rather thick so needed longer at a low heat. The spinach with garlic was very tasty though as it is cooked in the same pan. Quick and simple to make (the hardest thing is peeling and dicing the sweet potato!) and extremely tasty. What's not to like? I served this with some stir-fried savoy cabbage which nicely offset the sweetness of the potato and assuaged my need to serve something green on every dinner plate! 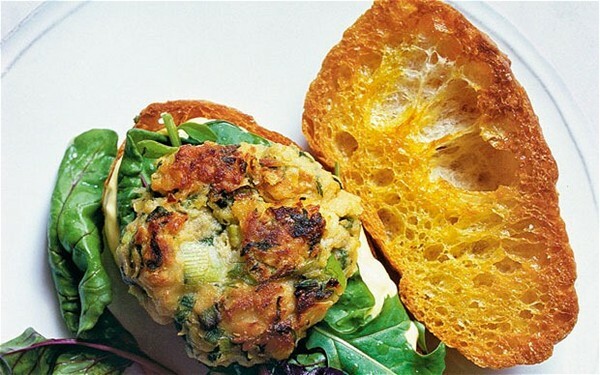 This is a great quick supper for weeknights. Simple and good. I usually find the taste of gremolata too overpowering, but this wasn't, although it was deeply savoury. The courgettes go with it very well. I subbed almond meal for the breadcrumbs to lower the carb content. I forgot to make the beans, but my husband really liked the chicken, and so did I. My go to duck recipe- simple ingredients and methods, resulting in complex and beautiful flavours. This simple and tasty recipe uses another variation on a classic Nigel Slater sauce that he uses often in his books. I used double cream instead of crème fraîche as I had some to finish and added more lemon juice - less healthy but very delicious! This was OK but nothing special. Really couldn't tell the lamb had been marinaded other than the fact that the yoghurt marinade made a lovely mess in my cast iron pan! This was delicious- fast , easy and so very comforting. Excellent everyday fare. Served with mashed potatoes and green beans, and the sauce went very well with both. Do take care the stock you use isn't too salty and only add salt in the end, else it can easily end up too salty. Too sweet for me. Might make it again with sherry or white wine instead of mirin. Have just made this for my lunch..... Delicious! served with some brown jasmine rice and tenderstem broccoli and a glass of lemon water. Cooked the chicken thighs on a griddle rather than under the grill as the recipe called for because grilling is to much of a faff for 2 thighs. Will try oven baking next time and butterflying the thighs for a quicker more even cooking. Didn’t find this dish overly sweet. Nice enough as written, but we found the feta cream was improved by a squeeze of citrus (I used lime but lemon would work well too). This seemed to enhance the taste of the mint which was in danger of playing second fiddle to the feta even though I used more than the 10 leaves suggested. The lamb was delicious. Takes some time until the peppers and onions are sweet but it's definitely worth the time. I added some thyme instead of basil, a small amount water when it seemed to become too sticky and a couple of drops of balsamic vinegar in the end. Very easy, very tasty. The kids loved it too. ETA: Also very good as meatball mix-in. Use less yogurt. One of those recipes I love Nigel Slater for. Extremely simple and very tasty, a warming winter dinner. A pity the kids didn't agree with me. I made this pretty much as written, except for using half the volume of water and adding some frozen peas to the sauce towards the end of cooking. A short cut I used was to use a hand mixer and just whizz the sauce inside the saucepan, instead of emptying half into a blender as instructed. The puy lentils took 25min to cook to the consistency I liked. This is very good and different from a normal vegetarian bolognese. (It doesn't use tomatoes). Delicious though I used 300g of lentils which gave me enough ragu for 8 (to freeze half for another meal). I would recommend some additions after cooking this a few times: 2 diced celery, couple of bay leaves, tsp oregano, pinch of dried chilli, 3 tbsp of tomato puree, a splash of red wine. Also a non vegetarian version with a pack of smoked pancetta lardons added. Loved the preparation and flavor of the lentils but did not care for having them with pasta. Much too starchy. Light as promised, but a bit disappointing. Not a usual Nigel Slater winner, family still liked it. I loved this, but I don't think I will be making it again soon, as the children didn't like it and my husband doesn't like large amounts of cream in his food. Very easy to make and really tasty. Very liquid though, more like poaching the chicken in the stock than a sauce. Afterwards I had some chicken and a lot of 'broth' left over, so I've shredded the chicken and blended the onions, tomatoes, apricots and liquid. Put them together again and hopefully I'll have a nice soup for tomorrow's lunch. Edited to add that the soup was very spicy, but absolutely delicious. Will definitely make this one again. This is the ultimate in comfort food. Smoked haddock cooked in double cream, which is then added to the cooked lentils! Keep an eye on the lentils as they cook as the liquid may need topping up. A classic easy supper which provides two generous portions. Good and simple. I like it best when there is plenty of spinach, about twice as much as the mackerel in the finished dish, else the mackerel gets a bit overpowering. I think I will add some mustard next time. Simple and good, but the amount of cream seemed excessive. I halved it and used creme fraiche instead of double cream, with good results. Very bland. Won't make again. This was a good soup. I wasn't sure it needed both mussels and hazelnuts but my husband liked the combination. I prefer using either one but noth both. I made this with leftover mussels and mussel broth that I had frozen, steaming the mussels over the caulilower to warm them. This worked well. He uses Dijon mustard. I used hot english mustard. It was hardly noticeable ,seemed to be diluted with the frying. Not as dominant as mustard flavour in Israeli chicken by Diana Henry. Still very nice meal. So very simple and quick to make, but full of flavour. This was a hit! Delicious and easy. The portion size was very generous too. Whilst the instructions weren't clear the picture did help. Great flavors. If using bone-in, skin-on chicken thighs, I recommend finishing them in oven before adding wine to make a pan sauce. Tasty, but much much soupier than I had anticipated (although I didn't let on) - I shredded the chicken thighs into the mixture and just served it as a soup! I didn't have the extra time to spend reducing the liquid, so this solution worked for me. A very simple soup/stew, but somehow everything is just right. The whole family loved it. I left it on the stove quite a bit longer than the recipe said, but that was no problem. This is so simple and so tasty. We loved it. I've been a bit out of the cooking groove lately - I have very limited cooking facilities in the rental apartment we're in for a few months plus finding ingredients that I'm used to having about has been hard - so I needed something easy and not using too many ingredients. This ticked the box and I'll happily make it again in the future. Absolutely delicious! The fennel seed is a lovely counterpoint to the sweetness of the apple / onion / maple syrup combination. I was slightly worried about how sweet it would be so I used Granny Smith apples and they worked really well. Simply served with roast potatoes this was a hit with everyone. Pg. 261. UK edition. 200C = 392F. Pork tenderloin at 1.2 lbs. I was slightly worried about the maple syrup here but I needn't have been. We used Grade B VT maple syrup and for me it simply added another layer of flavor in a dish that was absolutely delicious. 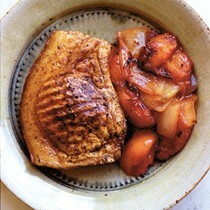 Loved the apples and onions combo that mingled with the meat juices. Note to self: next time crusty bread. Tasty, nutritious, and very little of the cooking time is active. Save a pan by wilting the spinach in the same pot you use to parboil the potatoes. Delicious combination - better even than the marmalade chicken that this is a variation of! Extremely easy and ready in half an hour! Pretty tasty. I had a chicken breast also so I cut it into same size pieces as the drumsticks. They were done about 10 minutes before the drumsticks. The skin wasn't crispy. A quick minute or two under the broiler may help the crispness....or the coating may burn. I made this using chicken thighs and added dried pepper flakes suggested in one of the variations - so easy, so very tasty. Just took longer to cook than stated - I used an instant read thermometer to check when it was done and it was in the oven for about double the time stated - I think my oven may be on the way out. We loved this and I have a request to make the variation with mango chutney next! I'm with breadcrumbs, the actual glaze doesn't really stick and without the addition of some heat/seasoning it is bland. Added some new potatoes to the vegetables. Used fillets instead of whole fish and only added them after the vegetables had roasted for 30 mins. The fillets are ready very quickly, mine took about 4 to 5 minutes. The flavors were good, but I was quite disappointed to find the fennel wasn't close to being done after 20 mins. Either precook the vegetables or cut them smaller. The latter method would stop the fish from falling off the vegetables too. I used shallots instead of leeks, and reinserted the liver in the fish after cleaning them. Both worked well. The orange juice really helps bring color to the chicken, and a nice taste too. My 8 year old son loved it. U.S. version THE REASSURANCE OF A CLASSIC p 280 Chosen as my 2nd scratch meal since hip replacement a couple of weeks ago because of its ease and simplicity (canned/jarred braised lentils with garlic, thyme, salt, & bay leaf sided to fresh cod cooked in foaming butter with parsley & a splash of wine vinegar.) Both were quite tasty and will be marked as keepers for a quick dinner. I served them with corn which was pretty but made the plate much too starchy - next time would do beans, broccoli or similar. The sauce is very cloying and I halved the peanut butter. I think it would be inedible with the full amount. The drumsticks came out very tasty, but the bean sprouts coated in the sauce were not nice. Absolutely delicious I found I didn’t need to part boil the sheets and only baked for 18 minutes- came out perfectly and both the lasagne and asparagus were cooked through. I’ll make this again. 3. 13. 14. Page 298. Loved this. Lots of flavor. Included caramelized red onions, mixed the mayo with Sriracha, omitted the watercress. (didn't have any) Everything on a soft potato roll. At the end of cooking time the dish was not even close to being as brown as the picture. I put it under the broiler to get it a bit browner/crispier. The combo of ingredients made for a very pleasing dish. Maybe turn the oven temp up from the getgo. Really delicious and quick, but not on the light side. Used half fresh and half canned tomatoes since this was what I had on hand. Will go into the regular rotation. The depth of flavour here is impressive. I thorough enjoyed the pork, the sauce and the oranges made this. Super delicious sauce. Can sub any sweet citrus. Loved this. With its double cream, bechamel & generous Parmesan, I'm sure one mouthful would render it impossible to fit into your pants, but it's worth it. Simple and tasty supper. I could imagine that the chorizo / bean / onion mixture would also work well with a cheesy mashed potato topping!! Quite bland - I was disappointed with this and won't make it again. Ridiculously delicious for how easy it is. Made without walnuts due to allergies. Tried with and without cheese but definitely better with. Nice as a side salad, not convinced as main. May have been too timid with the fennel? Will experiment again with juice and couscous. This looks like two recipes, one for the tomatoes and one for the cucumber, but the combination really is more than the sum of its parts. Excellent. I added a drop of vinegar and two leaves of mint to the dressing. Perfect on a summer day in the post Christmas glow. The plate is a riot of red, the cherries offset the salami and the tomatoes bring acidity. A delicious way to use up those extra cherries. I added bocconcini to the salad and used a sticky fig balsamic vinegar. Smitten Kitchen did a play off of this recipe, which is a very versatile little dessert. I made it with my own variation. I used pears, and raspberries/blackberries, but instead of maple syrup I used half honey and half pomegranate molasses. The tartness of the pomegranate really played well with the raspberries and chocolate. 2015 Piglet Community Pick. My copy is now a bright flurry of “to make!” and “to make again!” Post-Its. I can't think of higher cookbook praise than that. ...some recipes can turn out to seem hasty, when quick was what was intended. Still, as an idea book, it’s revolutionary. And most of these ensembles have the potential to turn into ravishing dishes..
An ingenious way to cook fish...start in a cold pan, and then simmer before capers and crème fraîche get added to finish. The result is silky, tender fish and a luxurious, fragrant sauce. How can three ingredients--drumsticks, marmalade, and whole-grain mustard--taste so good? Try it to find out. The much-loved author of The Kitchen Diaries and presenter of BBC1's Simple Suppers is here to help you cook real food fast, with over 150 recipes for delicious everyday dishes. Inspired by his own supper-time improvisations, Nigel Slater shows you how to make tasty and quick meals with the ingredients you have to hand. Full of inventive food ideas for those pressed for time, and with recipe variations and alternatives to suit any cupboard, Eat: The Little Book of Fast Food will be a feast of everyday inspiration.